Nokia's return to the smartphone market by way of HMD has already made an impact thanks to affordable hardware and clean Android One software. Nokia just announced a new phone today, but it isn't forgetting its older devices. 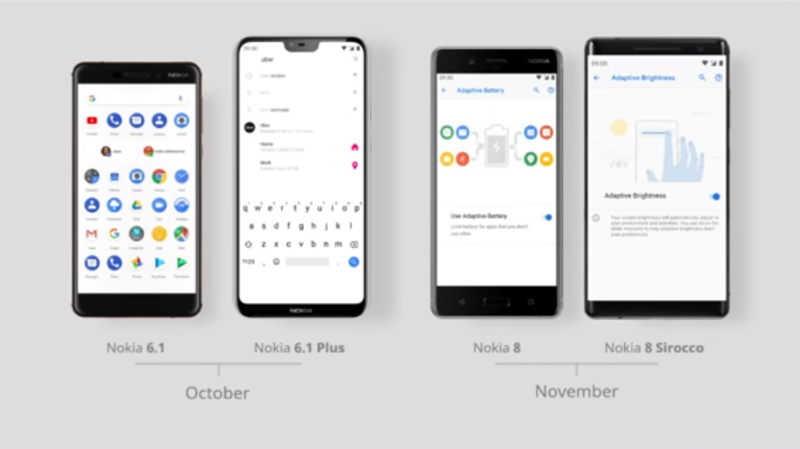 During the event, Nokia confirmed the first wave of Android Pie updates should hit its phones this month. The Snapdragon 600-series phones are first up for Pie with the Nokia 6.1 and 6.1 Plus getting the update later this month. The newly announced Nokia 7.1 is also expected to have Pie before the month is out (it launches with Oreo). Nokia's flagship phones, the Nokia 8 and Nokia 8 Sirocco are also getting Pie, but not until next month. You can see the announcement of this timeline in the video below around the eight-minute mark. Unlike most Android device makers, Nokia is all-in with Android One. That includes monthly security updates and system updates for at least two years from launch. When you get the update, it won't be cluttered with bloatware or clunky custom UI elements.